My latest India Currents article, “Advantage India“, was picked up and syndicated by New American Media under the title, “Why India Has An Advantage Over China“. 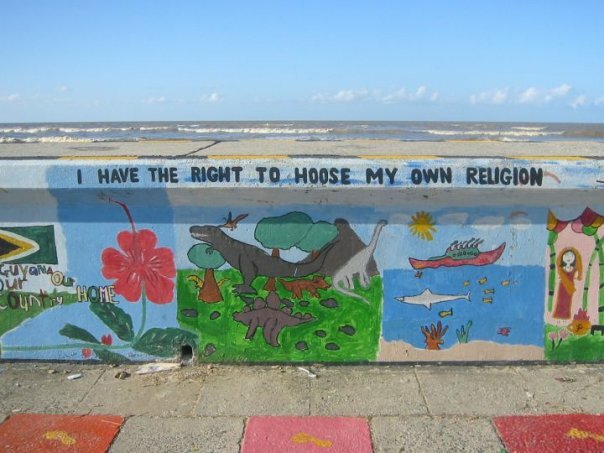 It’s a photo of a government- or NGO-sponsored mural drawn on the famous Georgetown sea wall. The funny part is that they left out the “c” in “choose” and no one seems to have noticed. The sad part is that their waters are polluted, even there in the park, with pop bottles and other trash thrown in. And due to drought, the levels of of their small pond are not being well maintained.